The trial of Nurpasha Kulayev opened in Vladikavkaz on May 17. Kulayev is the only surviving terrorist from the group who seized the school in Beslan on September 1, 2004. At least that’s the official version; the truth is that even many months after the tragedy neither the investigation, the court, nor a parliamentary commission can provide an explanation of what actually happened. And neither can the accused. The only thing we know for certain is that he was part of the gang that took the school hostage. But is he really the only surviving terrorist? Personally, I doubt it. I was an eyewitness to the events and so I’m sure that in the ensuing chaos some of the fighters managed to escape. The authorities stated there were 33 hostage-takers, presenting 32 bodies plus Kulayev, who was captured alive. Yet the numbers don’t add up. The surviving hostages claimed there were around 50 fighters, which would seem to be supported by the fierce battle that took place on the final day of the siege. Many mysteries surround Beslan, but the saddest is that the government, through incompetence, has failed to solve even one. The official version of events was effectively declared on September 8, 2004 by Vladimir Ustinov, Russia's Prosecutor General, and has remained unchanged to this day. The Prosecutor’s conclusions were simple: “All the fighters but one were completely annihilated, and that one is alive and under investigation today. Thirty dead bodies are in our possession. One body had been blown up and all we found were fragments.” How did it all happen? Quite easily - the weapons and explosives were brought in by the fighters themselves. And “immediately before the attack the terrorists - according to Kulayev, they were about 30 people, including two women - gathered in the forest near one of the villages and then headed in three cars to Beslan where they arrived early in the morning. They drove into the school yard and at the command of their leader, known as “The Colonel”, they surrounded the adults and children who were in the yard.” “When the terrorists, for some reason, tried to reconfigure the explosive system inside the school, there was an explosion that caused panic among the hostages who tried to escape. At that moment, the terrorists opened fire,” said Ustinov. A parliamentary commission headed by Aleksander Torshin, deputy chairman of Russia's Federation Council, set up to investigate the reasons and circumstances of the terrorist act in Beslan, has its own version of events. The commission has not yet presented any final results, but from time to time has reported on the work in progress. However, if by the beginning of winter 2004 the information arising from this commission differed from that of the Prosecutor, then by spring a consensus had been reached. Torshin’s information began to closely resemble the Prosecutor General’s report. Thus, one of the main questions, whether any of the fighters could have escaped from the school, had been set aside. Otherwise it would have to be admitted that the cordon surrounding the school was purely symbolic and of no use at all. But from what I saw, not even in one’s wildest dreams could the cordon in Beslan be called secure. Breaking through the “ring” was elementary. Another sensitive question that has been hushed up is whether there was only one group of hostage-takers led by the Colonel or whether they had local support. Several hostages claimed that part of the equipment was already in the school and the hostage-takers obtained it by ripping up the floor of the library, a version at first adhered to by the North Ossetian branch of the Federal Security Service (FSB) but later amended. Suddenly the official version was that the hostages had made a mistake and there was nothing to confirm the fact that weapons and ammunition had been stored in the school. And Kulayev confirms the official story. 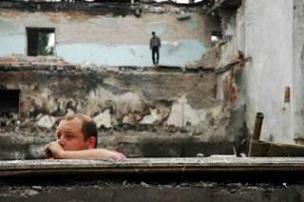 The mystery remains whether the terrorists had accomplices in Beslan. In autumn 2004 it was reported no less than three times that an accomplice had been arrested and was giving evidence. However, it has now become clear that there never was any accomplice. The subject of the number of dead and missing has also quietly died off. Right up until spring, the figures presented by the officials did not match those of the victims’ relatives. The authorities said that 330 people died and none are missing. Yet it is estimated that there are dozens of missing hostages and no information has been forthcoming about the fate of at least 40 of them. It’s as if these people never existed! In that regard I have a theory based on what I saw on September 4 when I photographed excavators working in the school yard, shoveling all the “rubbish” into piles and dumping it into trucks to be taken to a dump site. This “rubbish” turned out to be fragments of human bodies, along with clothing and shoes as discovered in spring 2005 in one of the dump sites in Beslan. This shows that an inquiry into the tragedy was not just sloppily conducted, but that it effectively never happened. Otherwise everything found in the school would have been included as concrete evidence in a case that should have been conducted by experts – how else could an accurate picture be created? Who fired what and at whom? Another Beslan mystery is the shooting that took place on September 3. Any normal investigation would have included a ballistic examination to establish who fired what and at whom. It is necessary to determine precisely who was shot by the terrorists and who was shot by the volunteers, police and special forces surrounding the school. Since there was no such examination, then everything can be blamed on the terrorists, including the complete failure of the government forces to prevent the events turning into chaos. One of the enduring questions is whether federal forces used the single-shot “Shmel” rocket flame thrower during the storming of the school. It‘s been said that the reason for the explosion in the gym might have been caused by this flame thrower. The discussion continues even now as officially the use of the "Shmel" is denied. Nor are there any witnesses who even saw this weapon being fired. However, there are people (including me) who saw the discharged launcher tubes from the flame thrower. They were carefully stacked near the telephone booth not far from the main entrance of the school and guarded by a member of some special police or military unit. But much later these launchers were left lying around and some boys were playing with them. That’s why this is no great secret. At the time it was completely obvious to me from the sound of the explosions that the attackers were firing on the school using hand held anti-tank grenade throwers. And towards evening a tank also fired on the building, so who knows how many hostages were killed by its shells. Incidentally, journalists from the German magazine, Der Spiegel, have recently published their own version of events in “The Beslan File.” But I think this only causes confusion. The writers make so many serious mistakes that there can only be one conclusion: they have absolutely no understanding of Russia, the Caucasus or the problems of the Chechen war. Therefore, this book contains no new discoveries or facts. Will the truth be told by the terrorist? In theory, the Kulayev court case should have answered all these questions, especially after everything suddenly did not go according to plan as the defendant denied the scenario prepared by the prosecutor. Kulayev has nothing to lose as he can expect nothing less than a life sentence; and it is well known that terrorists and guerrillas do not live long in the Russian prison system as they mysteriously die from illnesses. Almost immediately Kulayev refuted some of the information from the preliminary investigation. He declared that because of his poor knowledge of the Russian language he didn‘t understand what was being asked of him. The testimony was beaten out of him and he signed it because he was ordered to do so by the investigators. Kulayev insisted he had no prior knowledge about the attack preparations, that during the siege he didn‘t fire at all and, in fact, he wasn’t even armed but that he and several other fighters allegedly received a weapon once they were inside the school. However, only one thing is certain - Kulayev was captured unarmed. Although enough victims saw him being zealous during the siege, no one is now able to prove that he opened fire. The police failed to conduct the usual investigation of gunpowder traces on Kulayev’s hands when they arrested him so he can deny that he was in Beslan with a weapon, although in principle it is not possible to believe the fairy tale that there was an unarmed man taking part in the terrorist operation. But these are just details. Far more important are the terrorist’s other confessions. Although confirming the Prosecutor’s version of 32 people, Kulayev does claim there were some fighters already in the building before the Colonel’s group broke into the school. “We weren’t able to get into the yard as they began firing [at the pupils] from the first floor.” And at this point an investigation into such a version has not even been mentioned. Does this mean that there was another group in the school beforehand and that there were more than just 32 terrorists and that some managed to escape? The following revelation of Kulayev is also interesting: by gambling on the public’s growing hatred for the North Ossetian President Aleksandr Dzasokhov, he said the terrorist ringleader, “The Colonel”, was prepared to release 300 hostages if Presidents Dzasokhov and Murat Zyazikov of Ingushetia would come to the school. Was this then the goal of the terrorist attack? But that’s not the point. Judging from the hostages‘ description, strict discipline reigned among the terrorists. The Colonel even shot a female-suicide bomber who dared speak up against him; yet Kulayev, who said he was only there by chance and unarmed at that, turns out to be privy to the plans of his commander who never shared his secrets among even his closest circle. So either Kulayev is lying or he‘s not telling the whole truth about himself. Is he not such an innocent after all, but rather a well informed rank and file fighter? As a result, we have a bunch of secrets and mysteries. We don‘t know who actually planned the terrorist attack and what the goal of the attack really was; nor do we know how the operation was prepared and how many terrorists there were; or whether they had a local group supporting them and if supplies were delivered ahead of time. We have no understanding of any particular demands made by the terrorists. We don‘t know, and may never know, the true reason behind the explosion in the gym. And then there is the mystery about the other side of the barricades such as the chaos in Beslan, which also demands an explanation. And there‘s the legal proceedings, which have hardly begun yet have turned into a tragic farce. The prosecution, having exhibited the one and only defendant, has been acknowledged to be totally weak. It could neither conduct a standard investigation nor even force a minor actor to play the part according to its own rules and pre-written script. Vladimir Voronov is a columnist for the Russian magazine Novoe Vremya and occasional contributor to Prague Watchdog. In Beslan since Sept 2.